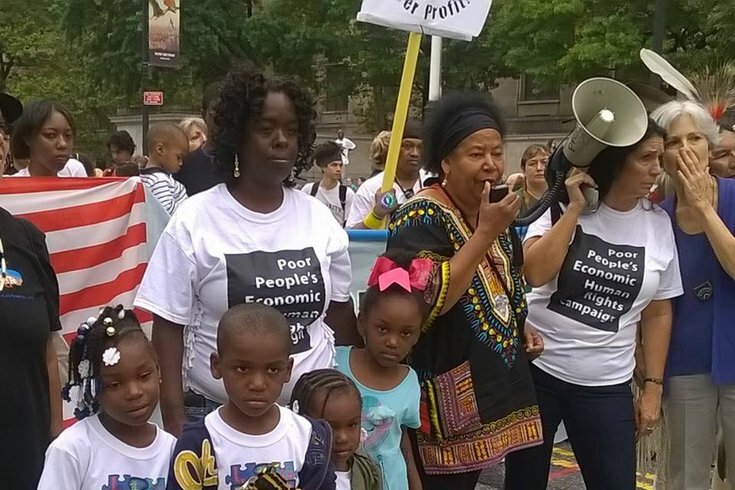 Members of the Poor People's Economic Human Rights Campaign protesting in Philadelphia. Pictured to the far right is Green Party presidential candidate Jill Stein, and standing next to her is head of the PPEHRC, Cheri Honkala. Most talk about the anticipated anger and frustration expected to accompany the Democratic National Convention in Philadelphia in July focuses on those “feeling the Bern.” That's justified: Of the five groups who’ve received permits to demonstrate during the DNC, three support Vermont Sen. Bernie Sanders. It won't only be "Bernie Bros" raising their voices, however. Denied a permit to march down Broad Street during the convention, one anti-poverty group – headed by a longtime Philly activist – still plans to hold its event without city approval. Cheri Honkala, head of the Poor People’s Economic Human Rights Campaign, said she will lead a coalition of disabled, homeless families, veterans and other marginalized groups down Broad Street to the foot of Wells Fargo Center, where the convention will take place. An activist, based out of Kensington since the 1990s, Honkala hopes to again use a national stage to bring attention to a city she said is in dire trouble. "I think people are very confused, that’s why some are gravitating toward that really scary guy, Trump. But what’s also really scary (is that) people are not thinking critically and following the money, and Hillary's history would be just as frightening." "I've been doing this work for three decades now, and it's just devastating," she said of the city's increasing problems, listing Philly's often-cited status as the poorest big city in America, high rates of drug overdoses and homeless population. She points out that the city almost exclusively has been governed by Democratic officials in modern times. "Basically, I view Democrats and Republicans as Coke and Pepsi," she said of the two major political parties. "They're both funded by corporations." In a year where those with "outsider" status — real or imagined — have captured voters' attentions on a national level, she's hoping to draw people to her message of rejecting the two-party system, saying they’ve both failed to address the issues that plague Philly and the nation. "I think people are very confused, that’s why some are gravitating toward that really scary guy, Trump," she said. "But what’s also really scary (is that) people are not thinking critically and following the money, and Hillary's history would be just as frightening." Neither party stands up for the types of people who will march down Broad Street without city permission, Honkala said. During the 2000 Republican National Convention, Honkala led a group of protesters on a nearly-identical route down Broad, also without a permit (then-Police Commissioner John F. Timoney decided to allow it). Honkala doesn't expect such leniency this year for her and the PPEHRC. "City operatives keep telling me, 'Cheri you know you're not going to be able to do it this time, they're going to scoop you,'" she said. Honkala claimed those operatives include people working in City Hall and in different levels of law enforcement, and by "scoop you," she meant arrest. To note, it would seem the fear of being arrested should be less than in 2000 when more than 400 protesters were cuffed. A bill is making its way through City Council that lets police issue $100 fines instead of making arrests for nuisance crimes, which include disorderly conduct, blocking a street and failing to heed a request to disperse. Philadelphia Police Commissioner Richard Ross recently told The Philadelphia Inquirer that the climate in the department is different than it was in 2000. He expressed interest in being flexible with unplanned protests and those without permits, but also told the newspaper, "People who want to be arrested will make that clear, but we will vet each and every situation as it takes place." On Wednesday, a police spokesperson said the department will be working with local, state and federal law enforcement officials to ensure "a safe atmosphere" for everyone, including convention attendees and demonstrators. "This is no different than other protests that we handle and we would hope that all planning to protest will respect themselves and others in a peaceful manner. Honkala's plan is for the PPEHRC to start at City Hall at 3 p.m. July 25, the first day of the convention, and go south along Broad Street all the way to the Wells Fargo Center, where much of the convention activities will be taking place. That differs from where the other planned and approved demonstrations will take place. So far, five demonstrations have gotten the city's OK: three at Thomas Paine Plaza in Old City, one at FDR Plaza in South Philly, and a mile-long march from City Hall to Independence Mall to support clean energy. The biggest of those events, being held in support of Bernie Sanders, is at FDR Plaza. It's been approved to take place from July 24 to July 28, spanning the entirety of the convention, and 30,000 people are expected to participate. Lauren Hitt, a spokesperson for Mayor Jim Kenney's office, said Honkala's request was denied not only because the proposed staging area already was being used, but also because it would require shutting down Broad Street in the middle of rush hour. Honkala doesn't buy that. She believes it's because she's the only applicant who isn't a Democrat. "I think that should be scary for everyone," Honkala said. "I don't necessarily agree with anarchists or other political ideas, but this is supposed to be America." The city offered to help the PPHERC reapply for a permit and include alternative routes that would be acceptable, but Hitt said officials haven't heard anything back. Honkala said conversations regarding the permit have ended. As of Wednesday, Honkala's request was the only official denial from the city. However, another is set to be rejected, it just hasn't officially been denied yet. Seven requests are still pending, and two of those are seeking routes identical to Honkala's. Both are for Sanders supporters. While her message screams anti-establishment, there is a political outlet for Honkala's movement. She was the Green Party's candidate for vice president in 2012 on a ticket with Jill Stein, who she supports again this year as the party's presumptive presidential nominee. She explained that the party, which came closest to national relevance when Ralph Nader got nearly 3 percent of the vote in the 2000 presidential election, is the only viable alternative to the donkeys and elephants, as it's organized in every state around the country. The Green Party's national convention will take place in Houston in August. Honkala wouldn't rule out another VP bid if she was offered the chance. "Well, you know, running for that high of an office is a very difficult thing to do. But if I have to I will."